Sep 15th What Does Twelfth Night Have in Common with Chinese New Year? To the Chinese, Spring Festival is as big, important and family orientated as Christmas. In fact the two have some rather similar traditions on ushering in good luck. During Victorian times Twelfth Night, the end of Christmas on the 6th of January, was still celebrated. Do you know that popular children’s game? Whoever finds the dry bean in the cake gets to be king, whoever finds the dry pea gets to be queen and everyone else has to wait on the king and queen. Provided you don’t choke on them, finding the dry bean or dry pea represents good luck coming your way. The pistachio nut is in fact a replacement for the coin, which posed much more of a health hazard, and threatened to reverse the good luck the moment it approaches the throat. This brings me to another Victorian tradition. 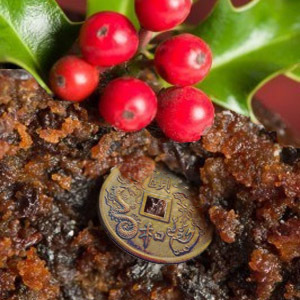 The inclusion of the coffin nail, menthol cone and sticking plaster as well as the coin in the Christmas pudding means that it’s not just the greedy chops who do better!